We welcome the positive step the Council has taken in the direction to effectively protect environmental human rights defenders (EHRDs) from the grave reality they face every day. By adopting the resolution by consensus, the Council has collectively and explicitly recognized the vital role of EHRDS, including in attaining the SDGs sustainable development goals and ensuring that no-one is left behind, and called for their protection. We also welcome the call on States to provide a safe and empowering context for initiatives organised by young people and children to defend human rights relating to the environment. We, however, regret that the resolution does not squarely address the obligations of international financial institutions and investors. We welcome South Africa’s leadership to put on the Council’s agenda emerging human rights issues, in bringing attention to the multiple and intersecting forms of discrimination that women and girls face in the field of sports, especially on the basis of race and gender. The Council has ensured its continued attention to grave rights violations across the globe. 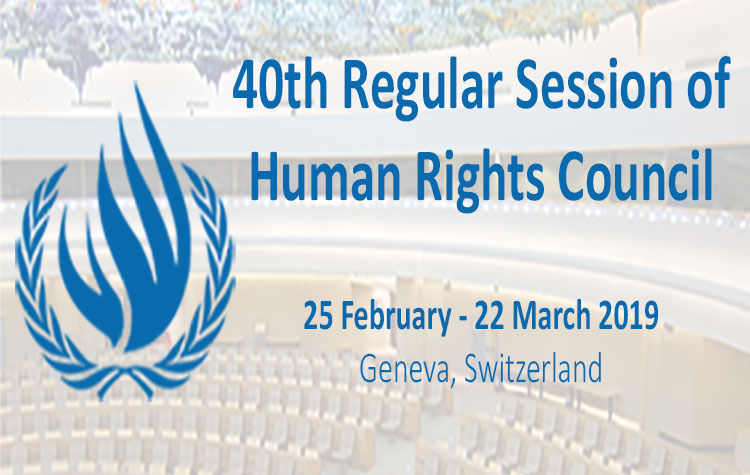 While we welcome the extension of Council attention on Sri Lanka for another two years, a concrete, transparent, and time-bound action plan is urgently needed to implement its commitments under resolution 30/1 in collaboration with OHCHR. Given the lack of progress and political will to implement these commitments, in the absence of immediate progress, the Council should consider additional measures or mechanisms for ensuring victims’ rights to truth, justice and reparations. Individual States need not wait to exercise universal jurisdiction. We welcome the resolution on Myanmar and its strong focus on ending impunity and ensuring accountability, and we call for the swift operationalisation of the Independent Investigative Mechanism (IIM). We welcome steps taken to review the UN’s involvement in Myanmar. We urge the UN Secretary-General to ensure that it is independent and transparent, and present the findings and recommendations at the Council’s 43rd session. We welcome the renewal of the mandate of the Commission on Human Rights in South Sudan, a vital mechanism for human rights reporting and evidence gathering. It sends the right message to the government and all parties to the conflict: There can be no lasting peace without justice. The Council continued this session to initiate action on country situations based on objective criteria through resolutions and joint statements. By adopting a resolution on Nicaragua, the Council sent a signal to victims of the current crisis that the international community will not allow impunity for the serious ongoing violations to prevail. We look forward to robust reporting from the OHCHR and we urge the Nicaraguan government to fully engage with the Office to ensure the victims’ rights to truth, justice and reparation. The Council sent a strong message of support to human rights defenders in Saudi Arabia through the joint statement by 36 States, led by Iceland, calling for the release of detained women human rights defenders and called on the Saudi government to fully cooperate with the Special Rapporteur on extrajudicial, summary or arbitrary executions in her investigation into the killing of journalist Jamal Khashoggi. We urge the Saudi authorities to respond fully to these calls, and States to follow up with a resolution at the June session to maintain attention to the situation until meaningful progress, including the release of defenders, is made. LGBT people in Chechnya are being abducted, locked up in secret detention sites, tortured and sometimes killed purely because of their sexual orientation. We welcome the joint statement on Chechnya delivered by more than 30 States and join the call on the Russian authorities for the persecution to stop: for the immediate and unconditional release of all detained for their actual or perceived sexual orientation or gender identity, and for swift, thorough, and impartial investigations. We welcome the Cameroon joint statement which advances both Council membership standards and its prevention mandate, and urge the Council to keep the matter under scrutiny. While we have welcomed the Council’s attention to several situations of gross rights violations, we remain concerned about the lack of consistent and principled leadership by States, in particular by Council members. We are disappointed that even though the demands of several EU and WEOG States to move the resolution on accountability for crimes committed in the Occupied Palestinian Territories from item 7 to item 2 was met, they still failed to support the resolution. This suggests that no matter the item number, some WEOG members continue in failing to protect the human rights of Palestinians, effectively shielding Israel from accountability. We regret that States have yet again failed to initiate Council action on the Philippines amidst continued unlawful killings in the government’s so-called war on drugs, and increased targeting of independent media, civil society organisations, and human rights defenders. We reiterate our call on the Council to take action to mandate an independent investigation to establish the facts of human rights violations including extrajudicial executions and attacks against media and civil society, address impunity, and take steps towards justice and reparations for the victims and their families, and hope action will be taken in this regard at the next Council session. We are deeply disappointed that the resolution adopted on Libya again lacks any meaningful accountability mechanism or mandate, despite the impunity for the widespread and systematic violations of international humanitarian and human rights law that prevail there. We deplore that despite credible reports of the detention of up to 1 million Uyghurs and other Turkic Muslims in western China, the Council has yet again given a pass to China, permitting impunity for widespread and severe human rights violations. The efforts China has made to keep States silent, exemplified by intimidation and threats on the one hand and whitewashing the situation on the other, demonstrate the degree to which Council action could have had meaningful results if States had instead called clearly and collectively for an independent, unrestricted fact-finding mission. On the resolution on the rights of the child, we regret the Council’s inability to emphasize the empowerment, autonomy and capacity of children with disabilities, and including to ensure that their sexual and reproductive health and rights must be respected, protected and fulfilled. We applaud Mexico and other States’ resolve to safeguard the independence of the mandate of the Special Rapporteur on the promotion and protection of human rights while countering terrorism and to resist any attempts to dilute, distract or distort its essential focus, ensuring that the Rapporteur can continue to have positive impacts both in preventing and responding to human rights violations committed in the name of countering terrorism and in relation to the human rights of victims of terrorism. We urge States to remain vigilant to resist future attempts to undermine the Special Procedures system- the eyes and ears of the Council. We welcome the Council’s renewal of the mandates of the Special Rapporteur on Iran and the Commission of Inquiry on Syria, so that both can continue to perform their vital work fulfilling their respective mandates and addressing the dire human rights situations in both countries. We urge the Iranian and Syrian authorities to change their posture of noncooperation with the respective mandate . Several of our organisations have urged the UN High Commissioner to publish the database on businesses in Israeli settlements and were alarmed at its further delay. We urge the High Commissioner to release the database with all due haste. We welcome the renewal of the Special Rapporteur on freedom of religion or belief mandate, and the maintenance of consensus on the Council resolution 16/18 framework for addressing religious intolerance. Rising intolerance and hate is a global concern, and States must move beyond rhetoric to action in implementing these standards. The High Commissioner’s update on Venezuela during this session reflected the dire human rights situation in Venezuela. We urge all States to consider what more the Council can do to address the worsening human rights crisis in the country and to support all victims. We note the highly disturbing report by the Special Rapporteur on adequate housing concerning grave reprisals by the Egyptian government against those who cooperated with her during her recent visit to the country and urge this Council to take action to address these attacks. We welcome the passage of the resolution on Georgia and the continued attention devoted to the importance of full and unimpeded access for the Office of the High Commissioner and international and regional human rights mechanisms.